I must give this product credit because it's the first permanent tee that I reviewed where they actually just sell you one tee. I keep asking the question, "If you can't break, it then why do I have to buy so many.?" Of course, the obvious answer is because you lose it when you hit it. But the ingenious inventors of this product have designed an anchor for the tee, thus don't you worry about it taking off after your ball. This product is goofy. I would only recommend it for novelty purposes. I will admit it makes a good conversation piece, but most of the conversation will be from your golf buddies making fun of you. If you are looking for a permanent tee because you want to save the planet or you're just tired of carrying around 20 tees in your pocket, check out the Flex Tee. 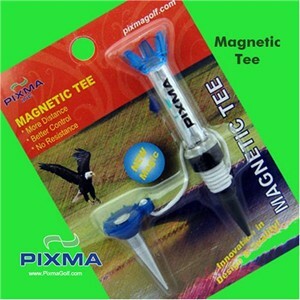 This tee is lightweight so it doesn't fly that far and also gives you a consistent tee height every time.